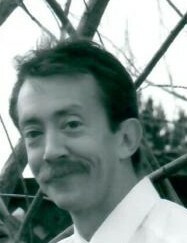 Richard Lowell Thomas, born July 8, 1964 to Richard Lowell and Barbara Ann Thomas, passed away early Monday morning April 1, 2019. Born in Anchorage, Alaska this “gentle giant” fought a hard fight with pancreatic cancer and never gave up. Even until the night before his passing he was still talking confidently about beating his illness. When he received his diagnosis, the doctors estimated that he only had weeks to live, but in a show of incredible will he lived three more years to the amazement of his doctors. His wife, Jackie, never left his side. Rick was an inspiration to many of strength and courage. Rick had wonderful memories of his childhood. He spoke often of the time he spent with his brother, Robert, and his cousins. He had fond memories of riding bikes in his grandparents basement, racing toy boats down the gutter, and playing sports. Rick was a very active man. He loved playing volleyball. If you couldn’t find him, it was often said in jest that he was probably off playing a set with his friends. In fact, he’s probably up in heaven playing a fierce match right now. Most of Rick’s family preceded him in death, so his friends were his adopted family; particularly his volleyball friends. He even met his wife, Jackie Ann Thomas, at a singles volleyball activity. They loved sharing this passion. He loved the outdoors. He and Jackie would often to on day trips enjoying old stomping grounds and natural wonders. They particularly loved their trips to Yellowstone and the zoo. Rick had no children of his own, but was a wonderful step-father and grandpa. He loved playing with the grandkids; always having a fun toy to entertain them with. He loved animals. When Jackie brought home a pet rabbit for the grandkids, he fell in love with little Mufassa and spent hours and hours with him; much to everyone’s entertainment. He joined the Church of Jesus Christ of Latter Day Saints as a teenager. He and Jackie have a wonderful ward family that they have felt so much love and support from. They are so thankful to all of them. Rick was welcomed to his heavenly home by many family members: his father, mother, brother, grandparents, an uncle, and several close friends. He left behind many who loved him, his love Jackie, his adopted family, and friends. They know they will see him again. It was Rick’s desire to be cremated so there will be no traditional viewing or graveside service. A memorial service will be held at 12:30 on Saturday, April 6 at their LDS ward house: 3610 So. 8400 W, Magna. Those who would like to visit with Jackie and family are welcome to come prior to the service between 12-12:30. Special thanks to Huntsman Cancer Institute, Dr’s and Nurses, Family, Friends, West Mountain Ward, and Independent Funeral Services.